President Barack Obama will be the first sitting U.S. president to visit Cuba since Calvin Coolidge did so in 1928, marking a historic moment in the diplomatic relations between the two countries. The renewal of diplomatic and economic ties has drawn widespread support in the U.S., but significant partisan differences on the future of the relationship between the two countries remain. 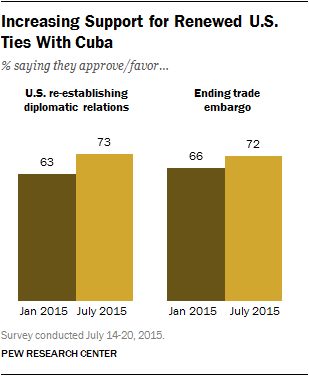 1 A majority of Americans support the renewal of diplomatic relations with Cuba. A Pew Research Center survey from July 2015 found that 73% of Americans approved of the thaw in relations between the two countries. A similar share also said they would favor ending the trade embargo the U.S. imposed against Cuba in 1960. Support for renewed diplomatic and economic relations had increased across nearly all partisan groups since January 2015, the month after Obama announced his initiative. 2 Americans are skeptical about whether Cuba will become more democratic in the near future. Fewer than half of those surveyed in July 2015 said they thought Cuba would become more democratic over the next several years. A greater share (49%) said that the state of democracy in Cuba would be “about the same,” while just 3% said they thought the country would become less democratic. There were significant partisan divides on the future of democracy in Cuba: Conservative Republicans were the most skeptical, with just 29% saying the country would become more democratic, while 59% predicted Cuba would remain about the same. Liberal Democrats expressed the most optimism, with a majority (58%) saying they believed Cuba would become more democratic over the next several years and just 37% saying things would remain about the same. 3For the first time, a majority of Americans have a favorable view of Cuba. A Gallup survey conducted in February found that 54% of Americans had a favorable view of Cuba. This is a dramatic change from the first time Gallup asked the question in 1996; then, just 10% said they had a favorable view of the country. But a partisan split still remains: Nearly three-quarters of Democrats surveyed (73%) said they have a favorable view of Cuba, while just 34% of Republicans said the same. 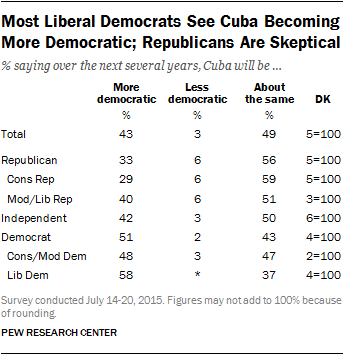 About half of independents (53%) said they have a positive view of Cuba. 4 The Cuban American community, long a source of opposition to restoring relations with Cuba, is changing. The number of Hispanics of Cuban ancestry in the U.S. has increased from 1.2 million in 2000 to more than 2 million, with much of the growth coming from those born in the U.S. In 2013, 57% of Hispanics of Cuban origin were foreign born, down from 68% in 2000. At the same time, a new, more recent wave of Cuban immigrants has arrived in the U.S. Since 1990, more than 500,000 Cuban immigrants have entered the U.S. Most recently, there has been a surge of Cuban immigration following Obama’s decision to renew relations. 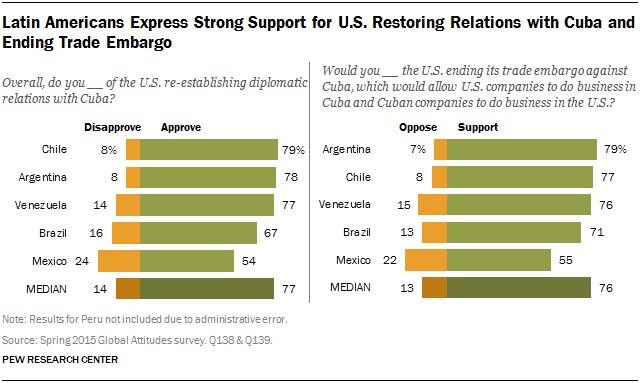 5The U.S. decision to restore relations with Cuba had strong support in Latin America. A majority across five Latin American countries surveyed in the spring of 2015 said they approved of the thawing of relations between the U.S. and Cuba. Nearly eight-in-ten in Chile (79%), Argentina (78%) and Venezuela (77%) said they approved of the renewal of relations between the U.S. and Cuba, as did 67% of those in Brazil and 54% of those in Mexico. There was similarly broad support for ending the U.S. trade embargo against Cuba. Support for ending the embargo was stronger among Latin Americans with higher incomes, compared with lower-income respondents. Correction: A sentence that read, in part, “In 2013, 57% of Cuban Americans had been born in Cuba” was changed to “In 2013, 57% of Hispanics of Cuban origin were foreign born” because not all foreign-born Hispanics of Cuban origin in the U.S. were born in Cuba.